Naomi Campbell is considering "every option available," including a lawsuit, after Cadbury used her name to promote its new Bliss chocolate bar, the Independent UK reports. 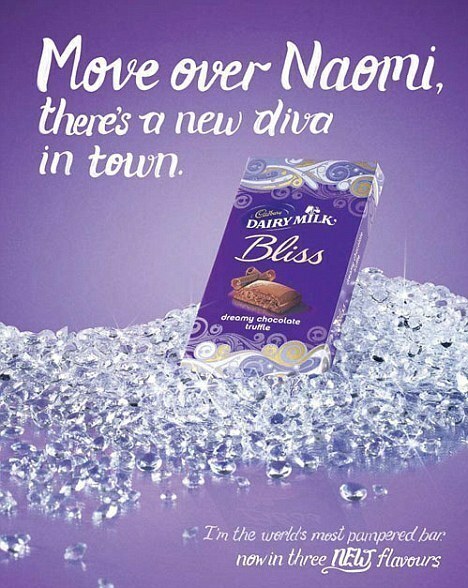 The advertisement reads, "Move over Naomi, there's a new diva in town," with an image of the candy posed on a mound of diamonds. According to the Independent, Campbell said, "I am shocked. It's upsetting to be described as chocolate, not just for me, but for all black women and black people. I do not find any humor in this. It is insulting and hurtful." Her mother, Valerie Morris, explained, "I'm deeply upset by this racist advert. Do these people think they can insult black people and we just take it? This is the 21st century, not the 1950s. Shame on Cadbury." The Daily Mail writes that black rights groups have backed Campbell's cause. Simon Woolley of the UK's Operation Black Vote, called for a boycott of the brand's products, adding, "Racism in the playground starts with black children being called 'chocolate bar.'" He has also contacted both Al Sharpton and Jesse Jackson. A spokesperson for Kraft Foods, which owns Cadbury, told the Mail that all billboards featuring the ad have been taken down, adding, "It was certainly never our intention to cause any offense and the campaign itself is a light-hearted take on the social pretensions of Cadbury Dairy Milk Bliss."